KATHMANDU, July 13: The Ministry of Home Affairs (MoHA) has put undue pressure on a doctor of the National Trauma Center to issue disability certificates even to those ex-Maoist fighters who are physically fit. MoHA is collecting the details of the ex-Maoist fighters disabled during the decade-long armed conflict in order to provide them monthly allowances. Up to Rs 12,000 will be provided monthly to each of the disabled Maoist fighters as allowance, according to MoHA. Dr Bhoj Raj Adhikari of the Trauma Center is a member of the technical committee formed by MoHA to confirm the disabilities of the ex-Maoist fighters. Dr Adhikari was called by MoHA officials on Tuesday at around 3:30 pm in the pretext of holding serious talks with Home Minister Ram Bahadur Thapa. He was grilled and released at about 6:30 pm. Dr Adhikari did not refuse to go to the Ministry after the call but told the ministry officials he did not have a personal vehicle but Home Minister Thapa’s aide Surya Subedi ‘Pathik’ told him to come to the ministry on a taxi. “Later, we sent a government vehicle to bring him,” said Subedi. When Dr Adhikari reached MoHA, Home Minister Thapa was not there. According to Dr Adhikari, Subedi grilled him blaming him for not issuing disability certificates to “warriors” and threatened to take action against him. “I called him but did not threaten him,” Subedi, however, told Republica. Dr Adhikari said that Subedi forced him to issue disability certificates to all who come to the Trauma Center for certification. 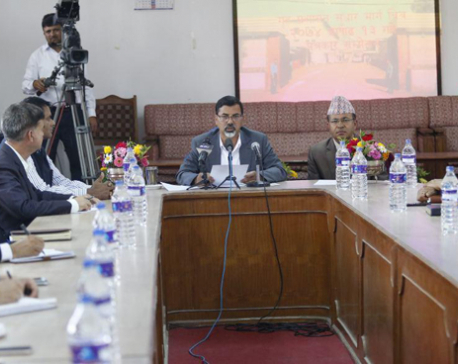 “It is against the ethics to issue disability certificates to those who are not disabled,” said Dr Adhikari. Minister Thapa’s another aide Kiran Bhattarai said that Minister Thapa was also willing to talk with Dr Adhikari about the issue. “But Minister Thapa was outside the office when Dr Adhikari was reached there,” he said.